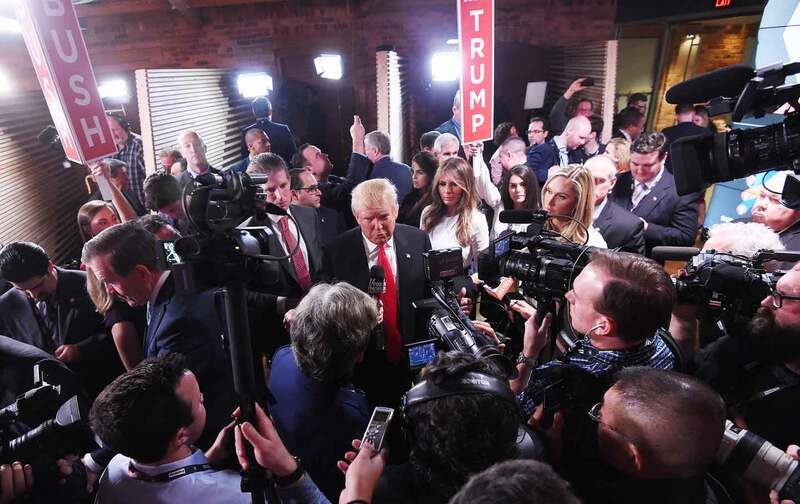 The mainstream media’s obsessive coverage of Donald Trump is warping not just a Republican presidential race that is spiraling out of control, but a Democratic contest that is of equal consequence. And that’s not the worst of it. Major media outlets are now so obsessed with Trump’s candidacy—and so addicted to the clicks and ratings associated with the spectacle it has created—that they can barely be bothered to cover the other candidates, and thus are neglecting the deeper issues and concerns shaping this electoral season. But Trumpmania has also redefined the Democratic race. The Republican front-runner has sucked up so much media oxygen that the Democratic contest is gasping for air. The GOP’s turnout is way up, while Democratic turnout is down. Only in a handful of caucus and primary states where the Bernie Sanders campaign has surged is turnout holding steady—or, in some cases, exceeding levels reached in the 2008 competition between Barack Obama and Hillary Clinton. On Super Tuesday, Democratic primary turnout was down roughly a third from 2008 levels. Barriers created by voter-ID laws and the evisceration of the Voting Rights Act were undoubtedly factors in several states. And it’s hard to compare the 2008 and 2016 Democratic races, since 2008 came after the catastrophic Bush years and was energized by the historic candidacy of Barack Obama. But the decline this year nonetheless has Democrats fretting. There are worries about reports from the Super Tuesday state of Massachusetts, where Secretary of the Commonwealth William Galvin noted that nearly 20,000 Democrats dropped their party registration in order to vote in the Republican primary. These turnout patterns frustrate the Democrats. Their party has a serious race on its hands—as the March 8 upset win for Sanders in Michigan confirmed—between candidates who are engaged in a great debate about who better represents the progressive ideals of the grassroots activists who have forced open the current discussions about inequality, failed trade policies, mass incarceration, and climate change. Why isn’t a contest that features an insurgent candidate mounting a vigorous populist challenge to a former secretary of state with strong support from party leaders and key constituencies attracting more votes than a Republican contest where the candidates argue about the size of their… hands? Anyone who understands how the modern media shape the narrative, as opposed to simply reporting on it, knows the answer. As of late February, the wrangling between Trump and his top two rivals (Rubio and Texas Senator Ted Cruz) was given twice as much time on network TV as the Clinton-Sanders contest. What’s bad for individual candidates is even worse for the democratic discourse. The saturation coverage of Trump has obscured the real story of 2016: Americans are strikingly agitated not just about politics and governance, but about an economic “recovery” that never seems to reach them, about real under- and unemployment figures that far exceed the official numbers, about wage stagnation that has continued for decades, and about the prospect that they are one trade deal or economic downturn away from losing it all. Grassroots Republicans and Democrats know that the deck is stacked against them. They recognize that the choices being made by Wall Street and Washington threaten to increase their burdens and narrow their opportunities. And they see too little evidence that social divisions and environmental challenges are being addressed. No 2016 candidate polls as highly as the notion that the country is headed in the wrong direction. The latest Associated Press/GfK polls show that 68 percent of voters think the United States is off course. This is not a partisan view: Democrats as well as Republicans share a concern that the government isn’t making the right choices, let alone the right preparations, for the future. Yet the media fail to open up these deeper discussions about inequality and economic instability; nor do they encourage candidates or parties to speak realistically about how the digital revolution, automation, and globalization are making the “new economy” look an awful lot like the old Gilded Age. The past 20 years have seen radical changes in the American media: the pandemic downsizing of newsrooms, sweeping layoffs of journalists, and a desperation for clicks and ratings that guarantees that civic and democratic values will always be trumped by commercial and entertainment demands. CBS chief Les Moonves says of the ratings and revenue bonanza associated with the Trump moment: “It may not be good for America, but it’s damn good for CBS.” Moonves is right: Media coverage that’s all about Trump, and misses the real story of 2016, is terrible for America.